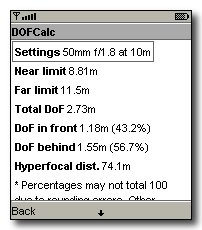 DOFCalc is a depth of field calculator for 35mm film SLR and digital SLR cameras that runs on mobile phones. This small J2ME program can run on all phones that support CLDC 1.1 or later, allowing you to calculate the depth of field in the, erm, field. Most people who carry a camera also carry a mobile phone. 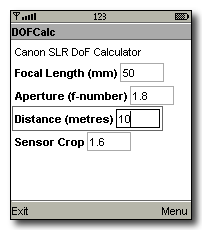 So it seems only natural to develop a DoF calculator that can run on a phone! The screenshots should give you a pretty good idea of how this works. It's generally suitable for any camera that can use a 35mm SLR lens - all you have to do is enter the focal length of your lens, the aperture you are using, and the distance to the subject you are taking a photo of. 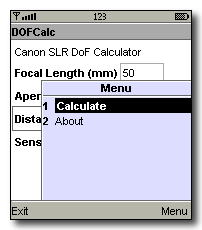 The program will then tell you what the depth of field is. Any brand of 35mm SLR film camera. Probably any other digital SLR that can use 35mm format lenses. Each time you run the program, it will remember the settings you used previously, saving you from having to fill in all of the fields more than once. Using my Canon EF 500mm f/4L IS to take photos of superbikes approaching from about 20 metres away, I used this program to tell me that the depth of field at f/4 was only about 37cm. This let me know that I had enough DoF to get the driver's heads in focus, but I would have needed to stop down to get the whole bike in as well. Do you use this software? Let me know - it's always nice to hear from people who have found this a useful tool. I have also written some other J2ME MIDlets.